We’ve been working on solving percent problems for a while now. The concept of identifying percent of a number was introduced using a double Numberline similar to what is shown below. I’ll admit, when I was in grade school I recall solving percents by cross multiplying. But as with most procedures, I didn’t understand how that strategy connected to the concept of percentage. I just knew the steps to follow to get the correct answer. Fast forward to me implementing a percentage lesson with my students, I was determined to make sure students understood the meaning of percent and applied it to finding the percent of a number. My initial thought was the double number line would be perfect for this. Using a lesson from Lessons & Activities for Building Powerful Numeracy, students were introduced to modeling part of a whole using the bar model. 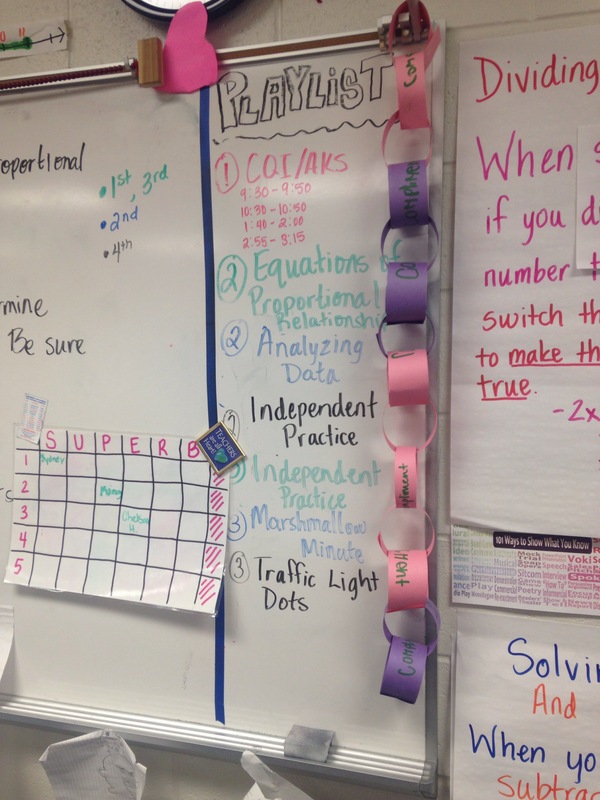 Students struggled making the sense of the bar model, so we looked at it as a double number line. This version helped some students but there were some who still had trouble visualizing it. For those students, strip models were introduced. ﻿﻿Students were given a strip of paper. One side represented 100%. It was split into 10 equal parts making each part 10%. Students were able to see the 10% + 10% that the 20% hash mark represented. The same strip was flipped over and another quantity represented. Students could use the percentage side to find say 30% and flip the strip to determine the equivalent amount to 30% of the whole. There was even a student who torn their scratch paper during our common assessment to make a strip model. Of course this wasn’t the only strategy discussed. Others came from the unit work, Getting Percentible from nzmaths. I wanted to take a amount to emphasize the beauty in seeing. Would I be wrong in assuming every teacher has had to do something in their classroom for compliance sake? Most of the time, it is a matter of paperwork to prove to someone, several years removed from the classroom, that you’re implementing what they have put in place, no matter how ineffective or illogical their initiative may be. Would it be safe to assume most teachers feel stuck in this position with no room to continue practices that really meet the needs of their students? I was there a couple of months ago, feeling that very same way. Until I remembered how I’ve lived majority of my life out of the box, causing some people to even called me weird. But here’s what weird people do, they take what’s given to them and make it fit their lifestyle. Let me be a little more specific. Every Friday, we are REQUIRED to implement a CFA over content in which the entire grade level showed an area of weakness. For the 1st twenty minutes of every class period, we have CQI time (I still don’t know what it stands for), going over previously taught or previewing concepts indicated as a low performance area. On Friday, we give an assessment to collect data, which I sometimes use to determine the learning targets to address in small group rotation. Another thing we are REQUIRED to do is give a skills test called Big 20. It covers the main skills addressed in the 7th grade, many we have yet to discuss during the core lessons. The data collected from this has not impact what so ever on my instruction. Let me rephrase that, it has no positive impact on my instruction, it actually takes time away from quality instructional opportunities, leaving only 4 days a week for instruction. This isn’t a post about complaints without action. This is a post about how to take life and make it what you need it to be. Friday’s now are sort of self directed. I normally post a flow chart of options for students. The CFA and Big 20 are staples per directives from administration, however there are many other options once students have completed them. Students have the option of taking mastery tests, completing assignments, working on the Question of the Week, playing a math game and even coming to work with me at the small group table. Often times, they end up helping one another leaving me to be the adult supervisor in the room. You can insert your favorite related cliché here. 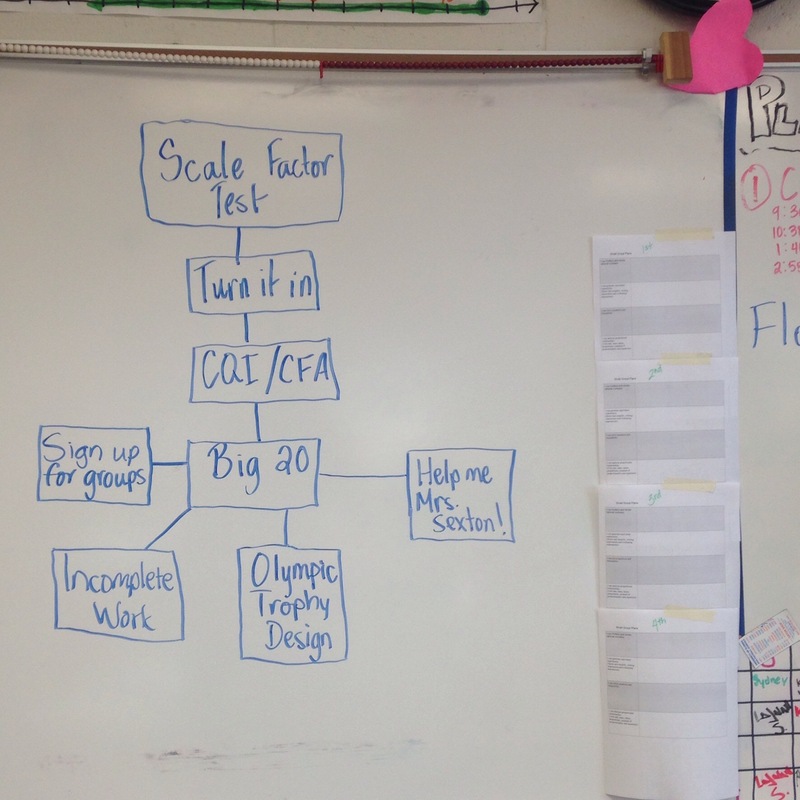 When you have 4 classes functioning at about the same level, it is easy to create a cookie cutter lesson and implement a “one size fits all” approach. What’s the harm, they all have to get it, so why not give it at the same time. After all, it can be a bit cumbersome doing different lesson plans for each class. The truth is, although it may appear the classes are functioning at the same level because your team has the “bubble kids”, they really are not. And within your lesson plans across the classes there’s need for differentiation. And with that there’s an even greater need for organization. This idea stems from a video I was encouraged to watch during the summer. 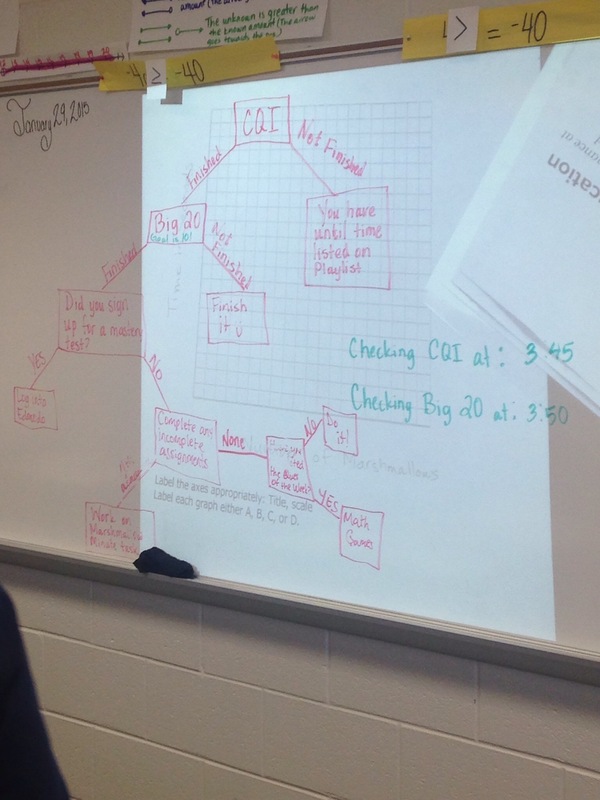 Within the video, the teacher and the students referred to playlist to give order for the task at hand. I implemented a playlist at the beginning of the school year bto provide students with that same order. It quickly evolved to my differentiation display. All 4 classes were working on similar concepts, however the process and in some cases the products differed based on the overall need of the class. Off to the side is a key to notate which class is associated with each color. Differentiation can sometimes be an overwhelming task. Beginning with the work of meeting the needs of individual classes can be a simple springboard to differentiating within a class and moving towards individualized instruction (or some form of it).